Later, in 1458, an Italian in Ragusa, Sicily wrote, "Rock candy ought to be white, glistening, coarse, dry, and clear." † These early boiled-sugar candies were either broken in irregular pieces, cut in squares, or molded into fancy shapes. It has also been popular in a crystalline form for centuries and was enjoyed by England's Queen Elizabeth the First in the 16th century. Rock candy is still popular to this day in its various forms. With the help of these old fashioned candy recipes, you'll be able to make this historical sugar confection for your family to experience. Experiment with white and brown sugars and pure food colors for variations in taste and color. Make crystal rock as they did in Elizabethan England. 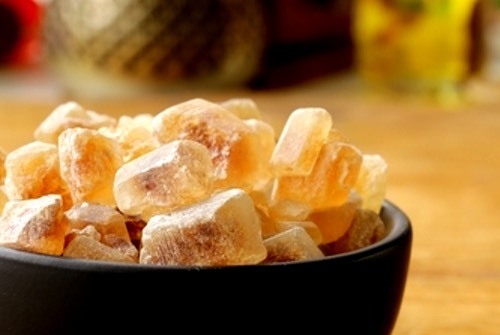 Crystallized rock candy was one of Queen Elizabeth I's favorite sweetmeats. Dissolve loaf or granulated sugar in water so as to make a thin syrup, suspend linen or cotton strings in the liquid, and let them stand undisturbed in a warm place. As the liquid evaporates, the strings will become covered with beautiful crystals of rock candy. Dissolve four pounds white sugar in one quart water. To make rock candy, boil this syrup a few moments, allow to cool, and crystallization takes place on the sides of the vessel. To make other candies, bring the syrup very carefully to such a degree of heat that the "threads," which drop from the spoon when raised into the colder air, will snap like glass. When this stage is reached, add a teaspoon of vinegar or cream of tartar to prevent "graining," and pour into pans. This is a similar production to nougat, and is made with raw sugar, which is boiled to the "crack." Pour it on an oiled stone (or pan), and fill it with sweet almonds, either blanched or not; the almonds are mixed with the sugar by working them into it with the hands, in a similar manner as you would mix anything into a piece of dough. If they were stirred into the sugar in the pan it would grain, which is the reason why it is melted for nougat. Form the rock into a ball or roll, and make it into a sheet, about two inches thick, by rolling it with a rolling pin. The top may be divided into diamonds or squares by means of a long knife or piece of iron: when it is nearly cold cut it into long narrow pieces with a strong knife and hammer. Provide a jug of clean cold water, and a piece of round stick. First dip in the water, then in the boiling sugar, and again in the water (this should be performed as speedily as possible); slip the sugar off the stick, still holding it in the water, then press it between the finger and thumb; if it breaks short and crisp, with a slight noise, it is at the crack. Loaf sugar [or granulated sugar] when boiled, by pulling and making into small rolls, and twisting a little, will make what is called Little Rock, or Snow. By pulling loaf sugar after it is boiled, you can make it as white as snow. † Quotes on this page are from "The Book of the Wares and Usages of Divers Countries," a historical document found within the book "Medieval Trade in the Mediterranean World: Illustrated Documents Translated with Introductions and Notes" by R. S. Lopez and I. W. Raymond, published by Columbia University Press, 1955.